The countdown to disaster builds momentum effectively, and the quick back-to-back entries in the last few minutes create an action-packed conclusion. Pignat has created a pitch perfect combination of multiple modes, well-tuned voices and a irresistible and satisfying story. ​...the author masterfully maintains each voice, giving readers an intimate view of how the characters feel about themselves, each other and the unfolding events. Moments shift seamlessly between the funny... the human... and the heartbreaking. Pignat deftly peels away the layers of the superficial personas, enabling the teens to appreciate and respect one another. Shooter delves into the teen psyche to reveal shared truths. Pignat continues to defy narrative boundaries in Shooter, alternating between journal entries, text messages, poems, pictographs, and newspaper articles. Her characters are impeccably voiced, and readers will move seamlessly from judgment to empathy, laughing out loud, only to turn the page and shed a tear. Shooter unflinchingly explores the many experiences of high school, the nuances and shortcomings of modern communication, and the loneliness that brews when communication fails. 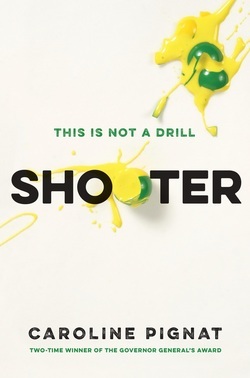 With gut-wrenching locked-room suspense, Shooter is a frightening, yet hopeful snippet of high school life in the 21st century. Pignat, a real-life teacher at All Saints Catholic High School, definitely knows how teenagers think, speak and feel. There is a ring of truth to the characters, their backstories and their reactions to horrific events. The plot is cunningly unpredictable... as the story moves to a nail-biter of an ending. ​Reading Shooter, it is easy to see why Pignat has already won two Governor General’s Awards for children’s books, Greener Grass and The Gospel Truth. How these seeemingly incongruent characters come together, and together they do come, in a complex plot of action, angst, and deliverance makes Shooter the extraordinary story that it is. ...Caroline Pignat’s brilliant writing immerses the reader in the terror of a school in genuine lockdown and the anxiety of relating to those whose differences make you uncomfortable. Beyond the drama, and there is much, Shooter is a story of empowerment, taken and accepted and relinquished, and a formidable tale told by one of Canada’s greatest writers.